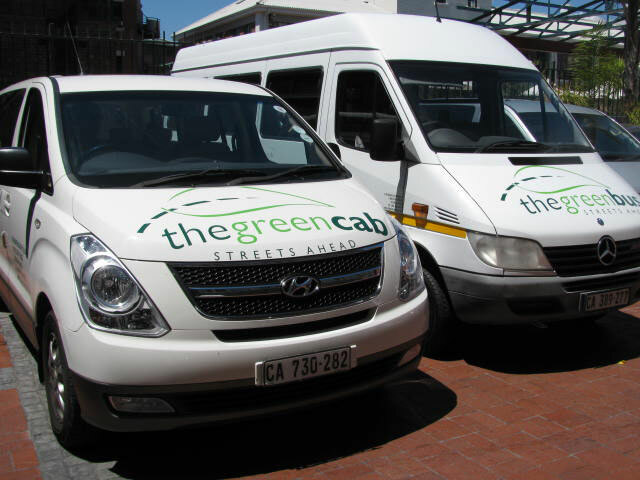 Green Cab is an eco-innovation company that provides South Africa’s first cost-effective, aggressively green tourism transport solution. It speaks to growing congestion and pollution challenges by means of a share-ride initiative utilizing Liquefied Petroleum Gas and BioDiesel. Liquified Petroleum Gas percentage reduction in harmful emissions as compared to petrol include: 75% less Carbon Monoxide; 85% less Hydrocarbon; 40% less Oxide and Nitrogen and roughly 10% less Carbon Dioxide. BioDiesel reduces the latter between 30 – 50%. Green Cab vehicle supplier of choice is Hyundai SA, the official sponsor of the 2010 Soccer World Cup. It was the only vehicle manufacturer in South Africa willing to extent their warrantees on new vehicles once they were converted to run duel-fuel on Petrol and LPG. Our growing fleet consists of Hyundai Elantras for the sedan component, and the brand new Hyundai 9-seater people carriers called the H1 Wagon. Our Bus is a 19-seater Mercedes Sprinter that is mostly deployed for daily tours and for shuttling Conferencing delegates.